But that morning he never showed up to clinical rotation. Sean’s mom Cheryl Collier knew something was wrong in the pit of her stomach. She’d messaged him that afternoon asking him about his first day. He didn’t respond. It was more than a mother’s intuition. It was the first night she was unable to reach him. The two of them had grown closer since the death of Sean’s father when Sean was 15. After six years of infertility, Cheryl began seeing a specialist and became pregnant with multiples. Cheryl recalls crying on her 30th birthday, doubting she’d ever have a baby. He was born May 28, 1991. Sean had just graduated as an officer in the Navy Reserve and had hopes of becoming a flight surgeon. Following five weeks of training in Rhode Island, he flew back to California on a Friday and stayed overnight with his mom on Saturday. The next day Cheryl, Sean and his step-dad Russell, had Mother’s Day lunch at the house. Sean then packed up his truck to head to LA. The next day was Monday and he’d begin practicing radiology during his fourth year of medical school. Cheryl checked in with Sean Monday afternoon via text to see how his day went. Cheryl has always been accused of being a helicopter mom so once Sean moved to Pasadena for school she said she tried to back off. Then that night around 10 she tried reaching him again. “Every bone in my body told me there was something majorly wrong,” she said. Cheryl and Russell began contacting Sean’s friends, law enforcement and the college administration. Then Russell received a call early Tuesday morning from Sean’s apartment manager. Cheryl said she was blindsided by Sean’s suicide, as she saw no signs of depression. According to a friend of his he’d even made plans for the summer. Everyone with the exception of one friend he’d confided in. A close friend of Sean’s told Cheryl that he’d called her crying—something Cheryl said was rare for her son. The friend told her she knew he was depressed and needed to get help. “I had no clue,” Cheryl said. She later found out about the prevalence of depression and burnout among medical students—something she wished she’d known about sooner. An investigation done in December of 2016 about the prevalence of depression, depressive symptoms, and suicidal ideation, which was published in the Journal of the American Medical Association, found the following: the prevalence of depression or depressive symptoms among medical students was about 27 percent, while the prevalence of suicidal ideation was about 11 percent. Luckily, Cheryl found support through Survivors of Suicide Loss after her counselor gave her the organization’s contact information. She and Russell began attending meetings about six weeks later. Cheryl said the second year without her son has been more difficult than the first and that without with label of “mom” she feels like she’s trying to find herself again. She said within six weeks all of her friends but one had abandoned her. They feel uncomfortable because I’m sad or because they know I lost a child.” People who have not experienced this type of loss, she said just can’t relate. People thinking they are helping, have given Cheryl advice such as to be grateful for what she has. She wishes that they could understand that it is difficult to be grateful when people are posting pictures of their children on social media. It is a reminder that she won’t have that memory with her son. Some of Cheryl’s favorite memories with Sean include going to many Padres baseball games and eating whatever they wanted. When asked about where she is today in her grief she was honest. Cheryl admits that she has struggled with thoughts of suicide herself. She says she’s a work in progress. When Cheryl first started attending her SOSL groups, she said it would take her about a week to recover because sharing her story and listening to others tell theirs was so emotionally exhausting. Today she said it feels like coming to visit family. “I think they (the meetings) save me. I think they have saved me from not hurting myself because I see other people’s pain,” she said. Eventually, Cheryl said she’d like to become a facilitator with SOSL. In the meantime, Cheryl and Russel go on vacations as a way to move forward and continue enjoying life together. They also attend nearly every SOSL meeting and she is grateful that Russell is able to continue to support her throughout her journey. She also finds joy once a week by babysitting the child of one of Sean’s former girlfriends. 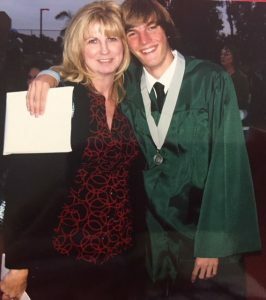 Since Sean’s death, USC has hired a director of medical student wellness, instituted mandatory “Keck Check” mental health evaluation sessions and now requires students to take several mental-health days off every year. In addition, a national movement was launched in 2016 by The Accreditation Council for Graduate Medical Education, to prevent medical school and residency suicides.